I’d like to start off this week’s party with a HUGE THANK YOU to everyone who joined in to last week’s party! It was so great to see so many new participants with great talents joining in! I also want to say a HUGE THANK YOU to those faithful linkers who have linked up right from the birth of this party! YOU make this party a success and I hope we can keep the fun going. The very best part of this party is visiting new blogs and browsing their talents. I especially love it when I visit one of the blogs linked up and I see others who have joined in leaving an encouraging word for their fellow linker! 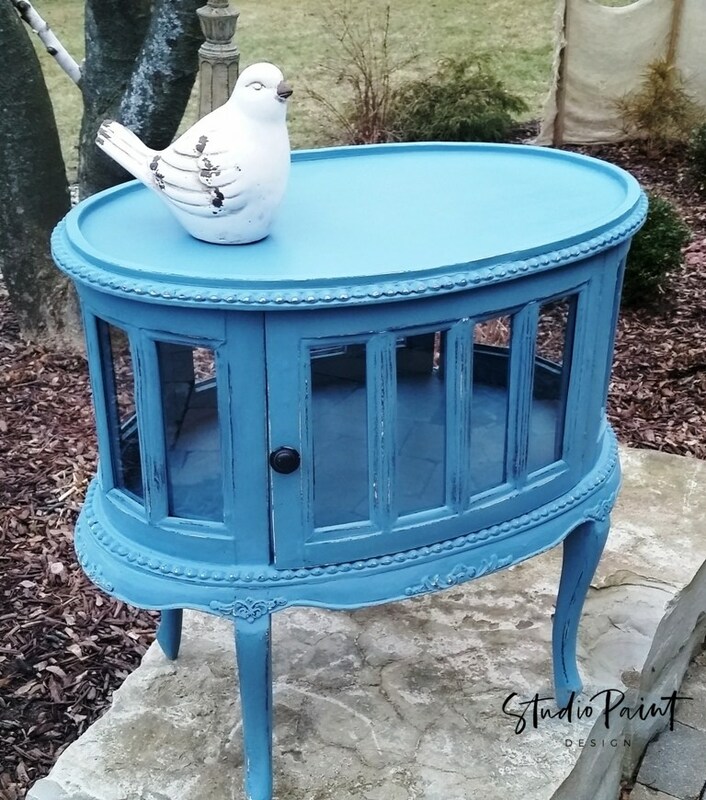 This little table by Maxine from Studio Paint jumped right out at me with it’s bright cheerful color and unique design! I love unique furniture and this table is soooo pretty! Gets me in the mood for spring! 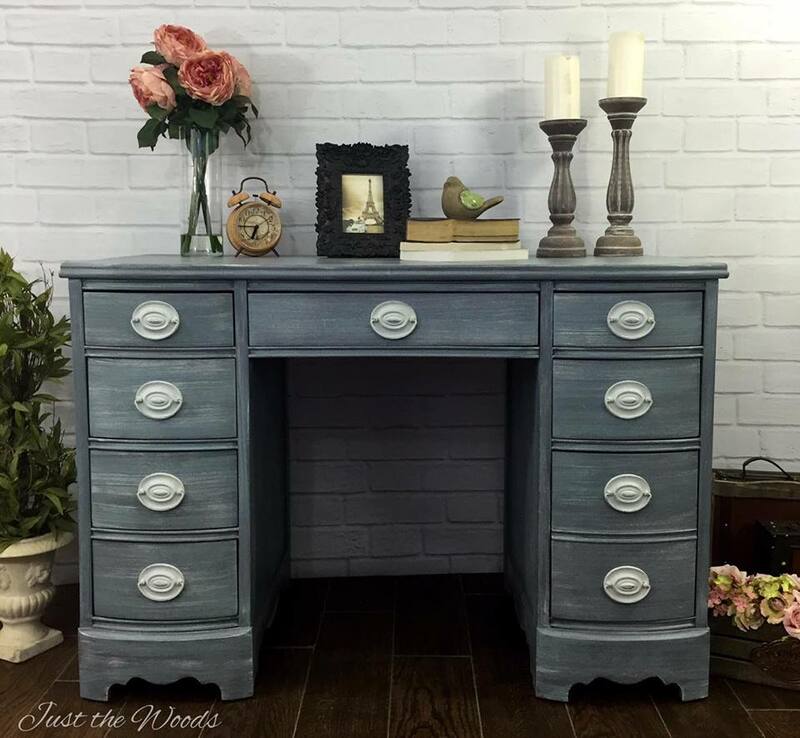 Ann from Farmhouse Blues Interiors took her thrift store find from tacky to stylish and classy by giving it a coat of love in the color Graphite! It is stunning with it’s bits of natural wood tone peeking through! … and she styled it perfectly! Love the hardware! Kandice from Just The Woods shared this beautifully finished desk! I love the finish of this piece accented by the crisp looking hardware! The styling of her photo is so pretty … Well done! 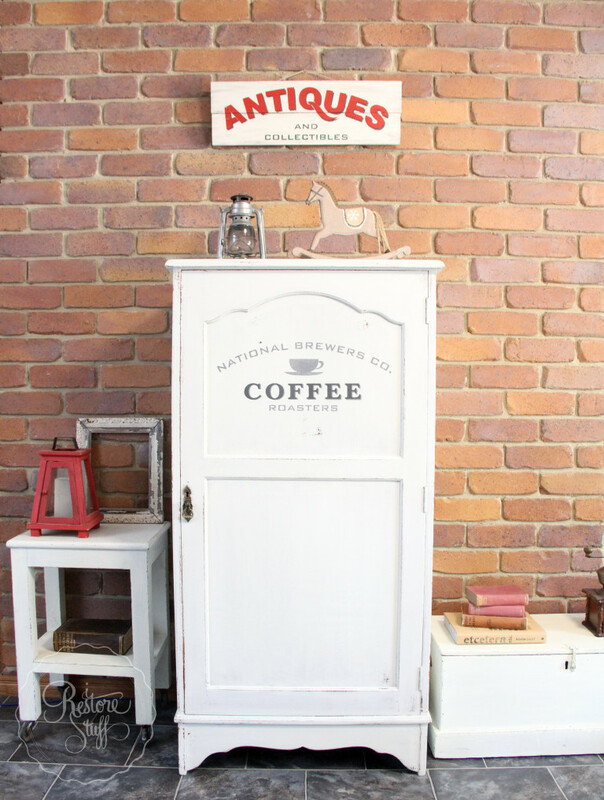 Sharon from I Restore Stuff shared this gentleman’s wardrobe painted in MMS’s new color FarmHouse White. I can hardly wait to try out this color. You really must go over and check out her tips for creating a shadow effect when stenciling. I’m not gifted with the stencil but even I will be trying out this technique! I hope you enjoy this week’s party and Happy Valentine’s to you all! Thanks Terry for the Feature!! Great line up once again!! You are so welcome! Thank you for sharing here! I hope you have a great weekend! That turquoise table is Devine. Naughty pets beware. I agree! Hope you have a great day! Thank you so much for the feature!!! <3 Have a great week!! You are very welcome! Thank you so much for sharing here! I hope you have a great weekend! Thank you so much for stopping by Maison de Cinq last week! I don’t remember if I ever popped over here to thank you, but I do appreciate your kind words and I always love meeting new, wonderful bloggers who love interiors/decor as much as I do! 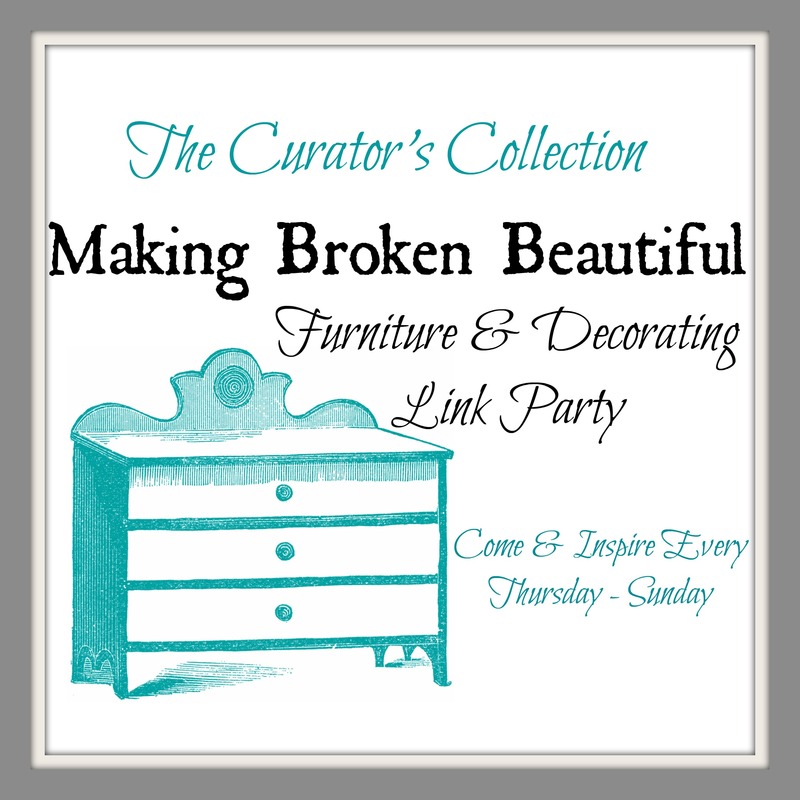 I have linked up to Making Broken Beautiful again this week and can’t wait to see what everyone has done this week! Thank you so much for coming Sheila and for your kind comments! You are sweet! I think you are very talented! I hope you enjoy the party and have a fantastic weekend! you do a great job picking out features. Thank you for all the work you do hosting this party every week. Awe! Thank you so much for the sweet compliment! I hope you enjoy the party and have a great weekend! Thank you Ann Marie! Happy Valentine’s Day to you as well! Have a great weekend! Thanks so much for including my hutch among your features! I hope you are having a wonderful weekend! You are so very welcome! I hope you have a great week! Terry, thanks for another fantastic party!! 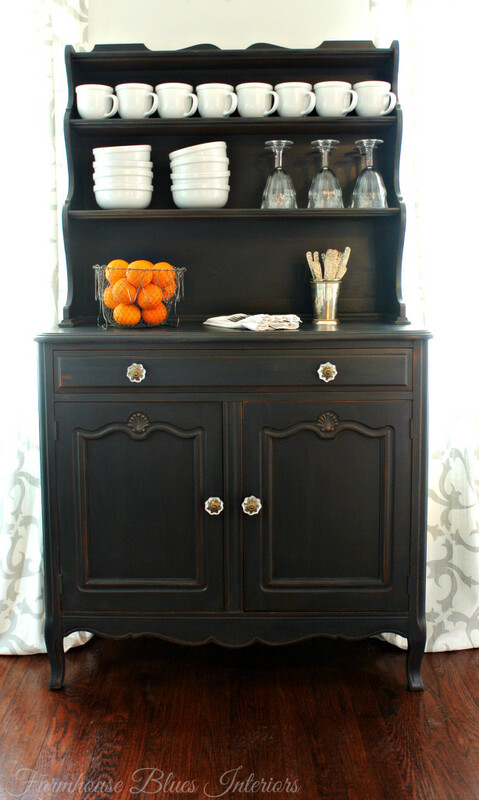 I’m loving that Graphite colored hutch!! I hope you are having a wonderful weekend!! 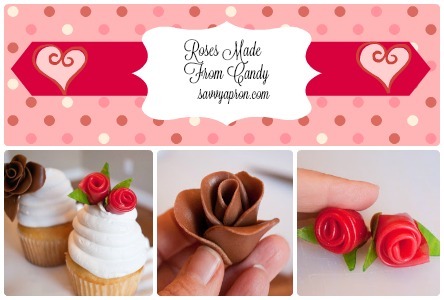 Thank you for featuring my Roses Made From Candy. I just saw this and it has made my day!